Surely, constantly forgetting what you were doing in the middle of doing something and constantly looking for your misplaced house keys is not the ideal way to spend your golden years. Don't wait until it is too late to start thinking about improving your memory. If you are bad at remembering simple to-do tasks, other people's names, your girlfriend's birthday, and other relevant pieces of information, use some of the most useful mnemonic devices illustrated below to help you retain things more permanently in your brain space. More importantly, be sure to practice good physical and mental health habits on a regular basis to keep your memory and brain stamina high. Get adequate sleep, eat healthy, and exercise frequently. Decrease stress and keep up your social life. Challenging your brain on a regular basis is also a must to constantly improve and maintain the strength of your memory. So how about tinkering with a Rubik's Cube or learning how to knit instead of watching television? Our brains need regular exercise just as much as our bodies. 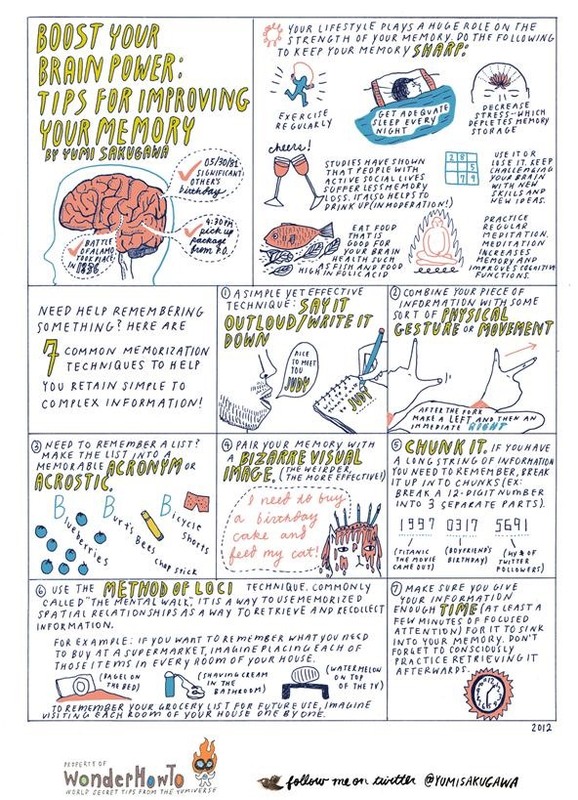 Got your own tips for improving your sense of memory? Share with us by commenting below!